There is a real hazard of identity theft and the risk for it to occur is huge. Someone going up to your mailbox and retrieving your mail is a simple way you can be made a victim. They build a false life around your name. They are able to sign up for credit cards and loans to buy things using your name. When no one makes payments, credit card companies will start harassing you and you won’t even know what it’s about. Even though this occurs to many people all over the country it is not necessary that you become a victim. A locking mailbox can safeguard you. 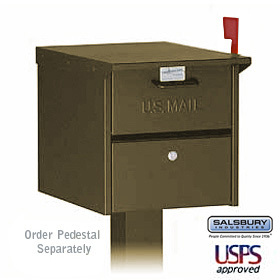 You are aware of the commercial mailboxes for apartments or office buildings. All tenants have a key to their locked mailbox for safety. Security that is just like this can be yours, as well. Many models and styles offer locking mailbox capabilities to protect you from identity theft. There are many types of these mailboxes available on the internet. Even slots are available that are capable of holding small boxes and packages for safekeeping. Breaking in your mailbox is the only way someone can get your mail but no crook is going to take a chance on getting caught when they could just go to another place and bother a normal mailbox. Regulations in your area may require you to contact your postal service and get approval for the mailbox. You might also need to worry about local ordinances, but this is unlikely. Now your mind can fully be at rest about the safety of your mail lying in the mailbox when you are out of town. By simply switching over form a normal mailbox to a locking mailbox, you can prevent identity theft.